By Patrick Doyle·	 12/26/2012, 2:00 a.m.
Three dozen graying men and women in suits gathered in Natick Town Hall one day in the middle of November to celebrate some exciting news: The town had just been awarded $2.5 million in state grants for improvements at the U.S. Army base in town, the Natick Soldier Systems Center. As local politicians stood in an arc behind a podium, a Natick selectman introduced Lieutenant Governor Tim Murray, who’s likely to run for governor when Deval Patrick’s term expires in 2014. 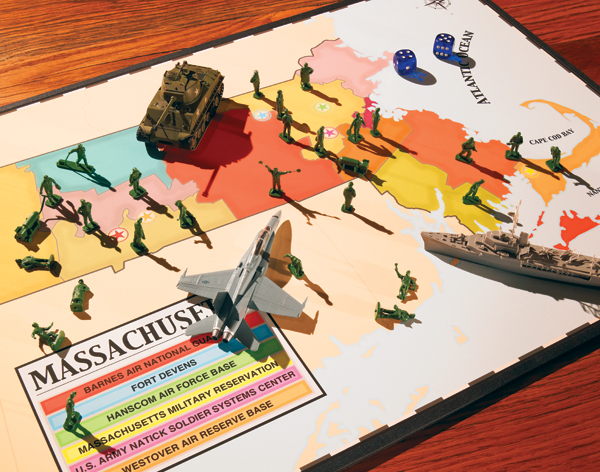 Murray made the politically wise decision last February to chair the newly created Military Asset & Security Strategy Task Force, a group set up to make sure that federal dollars—lots of them—keep flowing to military bases in Massachusetts. The Department of Defense hands out an enormous amount of money each year to academic institutions and defense contractors, and Massachusetts, which has plenty of both, is one of the chief beneficiaries. A study by the UMass Donahue Institute put the economic impact of our military bases at $14.2 billion in 2011, including 31,900 jobs, while a separate study found that the defense-contracting industry accounts for $13.9 billion in funding and more than 130,000 jobs. As Murray, a Democrat, began his speech, the celebratory mood from President Obama’s recent reelection was still hanging in the air. But Murray made a point to explain that, at least in one area, his views line up with those of Mitt Romney’s running mate. “I agree with Paul Ryan that the level of government that governs best is closest to the people,” Murray told the audience. “And that’s about all we agree on.” What he was getting at was that military spending in this country is almost certainly going to be reduced. And while most everybody seems to agree that defense expenditures need to be trimmed, nobody, least of all Tim Murray and the state he hopes to someday govern, wants to deal with the effects of losing that funding. Actually, the defense cuts are already taking place. The 2011 Budget Control Act mandated a $487 billion reduction in projected military spending over the next 10 years, starting this year. Defense Secretary Leon Panetta announced last January that most of those budget cuts would come from retiring aging aircraft and ships; increasing the share of healthcare benefits that some retired personnel pay; and reducing the number of active members of the Army and Marines by about 100,000. Adding to the pressure—at least as of press time—was the so-called fiscal cliff and its threatened across-the-board 10 percent, or $500 billion, cut in defense spending. Never mind that cliff, though: A number of think tanks, including the Center for a New American Security, Third Way, and the Commonwealth Institute, are advocating for defense cuts of $150 billion to $550 billion. Murray and a lot of other people believe that with all the budget slashing ahead, the stakes for Massachusetts are high. Which got me wondering: What is the military doing in Massachusetts? Aside from Fleet Week or a visit to Hanscom Air Force Base, you’re as likely to see a Revolutionary War reenactor around here as an actual uniformed member of the military. So just how dependent is our state on military spending? Think defense cuts, and the first thing that comes to mind is closing military bases and reducing the size of the Army. In the years ahead, we are likely to see fewer people in active military duty, but the future of bases is less clear. Congress threw a collective temper tantrum last January, when Panetta proposed a commission to examine the possible closure and consolidation of military bases this year. By August, Panetta had canceled those plans. Massachusetts, and New England, can be forgiven if they’re a little sensitive, having endured previous rounds of base closures that resulted in the shutdown of South Weymouth Naval Air Station and Loring Air Force Base in Maine. Today, in fact, fewer than 15,000 people are working on the six military bases in Massachusetts, most of them civilians, reservists, or National Guard members. The Census Bureau shows that fewer than 3,300 active-duty military personnel live in the state. That’s a pretty minimal presence compared, for example, with the more than 45,000 active-duty soldiers at Fort Hood, in Texas. These days, the military presence in Massachusetts is focused on training, reserve and National Guard duties, and research and development. We have Barnes Air National Guard Base, in Westfield (home to the Air National Guard 104th Fighter Wing); Fort Devens, near Fitchburg (mostly a training facility); the Massachusetts Military Reservation, on Cape Cod (a training site, for the most part, but also the base for the Air National Guard 102nd Intelligence Wing); and the Westover Air Reserve Base, in Chicopee/Ludlow (a reserve facility). The largest base is Hanscom Air Force Base, which is home to an electronics research site, a military-personnel support system, and the new Massachusetts National Guard Joint Force Head-quarters. These days, though, Hanscom Field serves as a public airport rather than an active military airfield.